Mobilink Jazz initiated an online story contest, Jazz Apni Kahani to acknowledge the importance of loved ones in making one’s dreams come true. Participants were required to submit their stories of achievement glorifying the role of their loved ones who helped them achieve their goals. 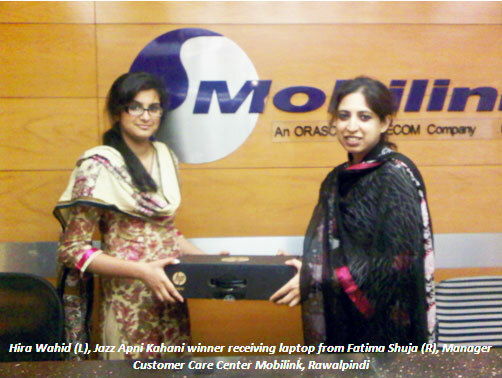 Hira Wahid, a student of NUST engineering college was declared winner of the best story and she won a brand new laptop while two runner-ups, Mazhar Abbas from Rawalpindi and Abdul Ghani from Karachi won mobile handsets. The contest also gave away 50 free minutes each to 30 lucky Jazz participants through Jazz Apni Kahani Lucky Draw.